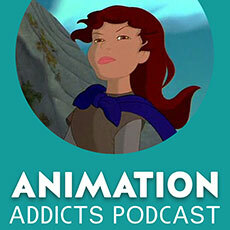 The Rotoscopers head back to medieval times to discover King Arthur, the Knights of the Round Table, and a really bizarre movie: Quest for Camelot. • Morgan has faint memories of seeing this with Chelsea, but… remembers nothing of the film. • The movie poster turned Morgan off. • This is an example of what happens when oblivious executives meddle in a film. • The music suffers. What is it trying to be? Serious? Comical? A musical? • Garett: He has a bird companion who is not evil! • The conjoined twin dragons are the worst part of this film. Why the goofy, obnoxious song? • Why do animated films feel the need to dumb it down? • What we (and our Twitter followers) would have done to make this movie better.